"And I'm not going to arrest you," he adds. Heather collapses in his arms, sobbing with relief. "I love you," she tells him & she's says it over & again a few times until he laughs. "I love you, too, Heather, " he says, & then he becomes very serious & tells her she has to stop selling out on the streets. She tells him about Byron Palisades & how he is going to effect Heather's business. "Byron Palisades?" Ulises is impressed. "'The Watchmen' is my favorite movie: do you think you could get me his autograph?" Heather's gone from believing Ulises was a drug dealer & fearing he might be involved with worse crimes, to finding out he's a cop & fearing he was going to take her to jail. Now she's coming to terms with the shock of discovering that she is in love with a cop. "Heather," he starts & she knows he's about to dive into another sensitive question, although she can't imagine what, now, "Do you smoke a lot of that stuff you sell?" Heather laughs, "I don't smoke it at all. Smoking's bad for you....I eat it." "You...eat...it?" he says so blandly she isn't sure it's a question, "You mean like brownies?" he asks. "Sure, I make brownies sometimes, but I eat it in regular food, it's the best way really...." "You've fed it to me?" he asks & she nods. "Heather," he sighs "some people have to take drug tests as part of their jobs..." Heather clasps her hand to her mouth as she realizes what that means. He puts his arm around her comfortingly, and caresses her cheek, it seems like there is nothing she can do that he won't forgive, "I'm a vice officer, it's expected I might have to use narcotics once in awhile during a set up, so it's not a big deal, but you really should be more careful," he says "You are going to get yourself or someone else in a lot of trouble if you aren't more careful." It's way past breakfast by the time their talk is through. 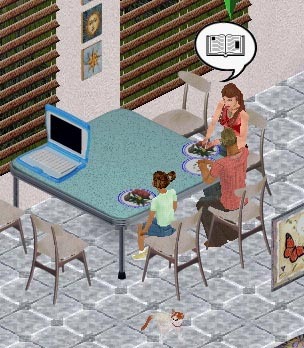 Amber's come home from school & Ulises & Heather are both starving from not having eaten. Heather gets some dinner together while Amber hangs out with Ulises....Amber really does seem to like him a lot. Over dinner Heather invites Ulises to come with her & Amber to get their Christmas tree...Ulises seems even more thrilled than Amber. Heather is by far not the only drug dealer on the streets of Hollywood: Ulises has to leave for work right after they eat. The van will have to wait another day to be fixed. Heather whispers in his ear that there is a guy that sells crack in front of the flop house next to the Motel 6 across the street from Coby's Apt. building. "He's there all night and until around 10 or 11 am. Poor Coby can't go to the corner store without being hassled by a dozen crackheads asking for change on the way." And she tells him he can let himself in after work again, if he likes.